Resource types are important for your Jomres booking site as they are used when configuring your properties. You can add resources like different bedroom types, car/yacht rent, etc. Once you have accessed your Jomres dashboard, navigate to the Site Structure>Resource types section of your main panel. To add a new resource type, click on the +New button at the top left corner of the page. Business feature abbv - Short name for the feature. Once you are ready, click the Save button to create the new Resource type. To edit a resource type you will need to be in the Resource types section of your Jomres back-end and you will need to click on the Edit button corresponding to the resource you wish to edit. In the image below you will see that we have set up an incorrect image for the 3 person Bedroom. 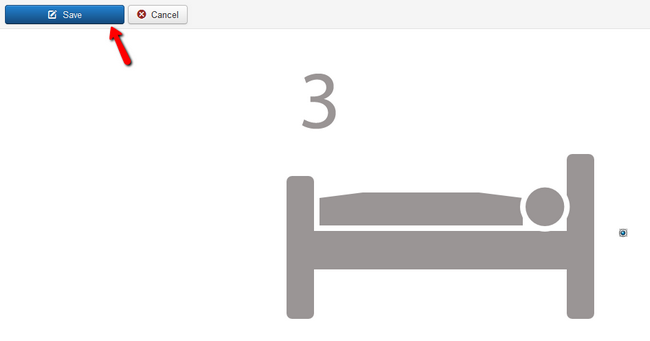 Let us select an image that suits the resource better, like a pictogram with a bed and the number 3. Click the Save button to apply and save the change we made. Now we only need to apply this resource to our property. To learn how to do that, please visit our Rooms and Availability tutorial. Once you have followed all of the steps in that tutorial, the example property CuteCottage will have the rooms configured as we wanted. Our users will now be able to book a room or two in the CuteCottage.